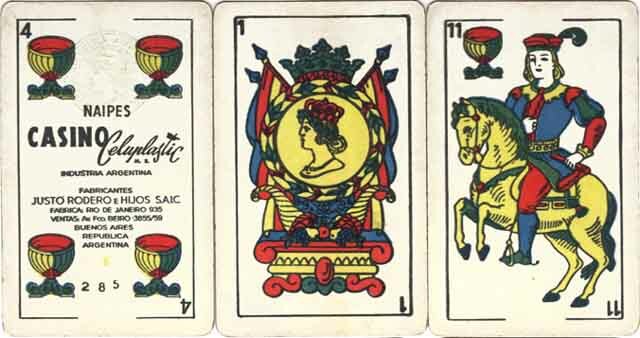 Above: wrapper and four of cups, with tax stamp, from a standard "Naipes Casino" deck, made by Justo Rodero e Hijos S.R.L., c.1970. Justo Rodero had immigrated to Argentina from Spain early in the 20th century. His interest in the graphic arts led him to start up a ticket printing business during the 1920s. He founded his playing card manufacturing business in 1930, which over the years has become established as one of the leading manufacturers in Argentina with exports to Uruguay, Paraguay and Chile. Mostly standard packs are produced, and some advertising versions are also known. 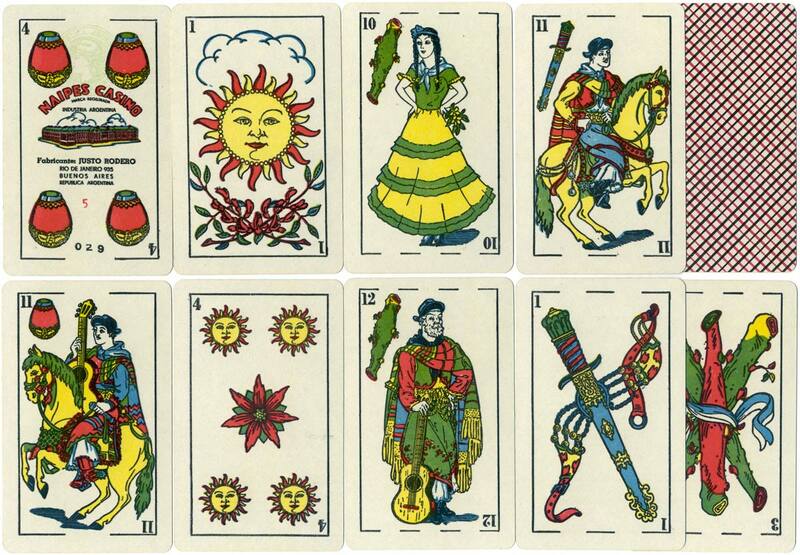 ← Left: four of cups from "Casino" pack by Justo Rodero, c.1960, before "e Hijos" was added to the name. Left: tax band from pack manufactured by Justo Rodero e Hijos S.R.L. in around 1955-60. 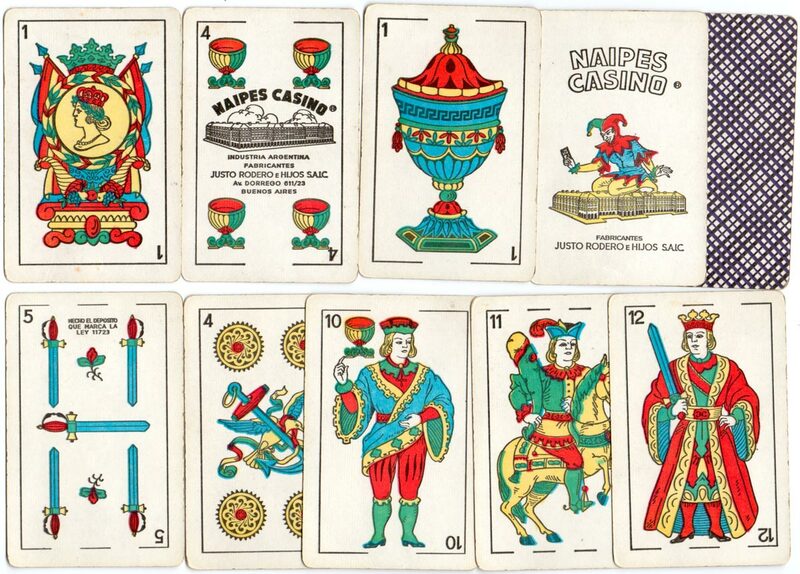 Left: "Naipes Casino Celuplastic" c.1967. The 'Marianne' tax stamp is just visible on the four of cups, along with the trade name for the plastic coating process which was applied to the cards. The name of the company has now been amended from "Justo Rodero" to "Justo Rodero e Hijos S.A.I.C. ", and the addresses can be seen to change over the years. 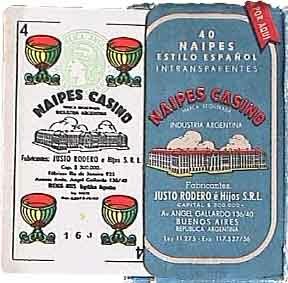 The range of brand names produced by Justo Rodero over the years includes: Naipes Casino, Naipes Casino Celuplastic, Naipes Casino Estilo Argentino, Naipes Habana, Naipes Casino Poker and Naipes Casino "Sidecar"